On Dec 10th 2018, AICM held 2nd Product Stewardship workshop in Henkel successfully. RCC deputy chair, Mr. Xiao made opening speech. We were honored to invite senior expert from Shanghai Academy of Public Measurement to introduce chemical ecological risk assessment, discussed the bottleneck and future of China ecological risk assessment system as well as WoE practices. In the afternoon, the experts from Entry-Exit Inspection and Quarantine Bureau interpreted the latest plan on food related regulations revision and migration testing of new substances. 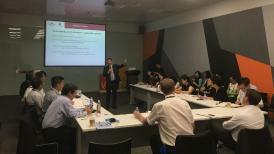 After that, Nini Lin from Henkel presented Food Contact adhesive compliance practice and challenge sharing and Zhang Xiao from Dow discussed the challenges and opportunity brought by GB 4806.11 revision. There’re total 45 participants attended.